Insulin-like growth factor 1 (IGF-1) has poor anabolic efficacy in cartilage in osteoarthritis (OA), partly because of its sequestration by abnormally high levels of extracellular IGF-binding proteins (IGFBPs). We studied the effect of NBI-31772, a small molecule that inhibits the binding of IGF-1 to IGFBPs, on the restoration of proteoglycan synthesis by human OA chondrocytes. IGFBPs secreted by human OA cartilage or cultured chondrocytes were analyzed by western ligand blot. The ability of NBI-31772 to displace IGF-1 from IGFBPs was measured by radiobinding assay. Anabolic responses in primary cultured chondrocytes were assessed by measuring the synthesis of proteoglycans in cetylpyridinium-chloride-precipitable fractions of cell-associated and secreted 35S-labeled macromolecules. The penetration of NBI-31772 into cartilage was measured by its ability to displace 125I-labeled IGF-1 from cartilage IGFBPs. We found that IGFBP-3 was the major IGFBP secreted by OA cartilage explants and cultured chondrocytes. NBI-31772 inhibited the binding of 125I-labeled IGF-1 to IGFBP-3 at nanomolar concentrations. It antagonized the inhibitory effect of IGFBP-3 on IGF-1-dependent proteoglycan synthesis by rabbit chondrocytes. The addition of NBI-31772 to human OA chondrocytes resulted in the restoration or potentiation of IGF-1-dependent proteoglycan synthesis, depending on the IGF-1 concentrations. However, NBI-31772 did not penetrate into cartilage explants. This study shows that a new pharmacological approach that uses a small molecule inhibiting IGF-1/IGFBP interaction could restore or potentiate proteoglycan synthesis in OA chondrocytes, thereby opening exciting possibilities for the treatment of OA and, potentially, of other joint-related diseases. Insulin-like growth factor 1 (IGF-1) was originally discovered in 1957 by Salmon and Daughaday as a potent growth-hormone-dependent serum factor able to stimulate sulfate incorporation by cartilage in vitro . During postnatal, childhood, and pubertal life, IGF-1 stimulates the linear growth of bones by increasing the proliferation of epiphyseal chondrocytes and remodeling processes within the growth plate cartilage [2, 3]. During adulthood, IGF-1 plays a crucial role in the maintenance of homeostasis in articular cartilage, by stimulating the production of matrix proteins by chondrocytes [4–6], counteracting their degradation [6–8], and preventing cell death [9, 10]. IGF-1 displays its biological effects in cartilage through the IGF-1 tyrosine kinase receptor , structurally related to the heterotetrameric insulin receptor . The accessibility of IGF-1 to its receptor is regulated by extracellular IGF-binding proteins (IGFBPs), secreted by chondrocytes but also by the other joint tissues. Although the secretion of IGFBPs by chondrocytes is constitutive, it is also stimulated by IGF-1 itself. This mechanism regulates the amount of the free, bioactive form of IGF-1 [13, 14]. In case of need, IGF-1 can be released from IGFBPs. The proteolytic cleavage of IGFBPs by various proteases dramatically decreases their affinity for IGF-1, thereby increasing its bioavailability . The action of IGF-1 in cartilage is altered during ageing and in various pathologies such as osteoarthritis (OA), leading to a decrease of anabolism and a detrimental increase in catabolic events . Despite the increased degradation of cartilage in OA, the expression of IGF-1 mRNA is up-regulated in lesions of OA human cartilage [17–19], and IGF-1 protein levels rise in the synovial fluid of OA patients compared to healthy subjects [20–22]. In dogs, IGF-1 levels in a knee joint that had undergone cruciate ligament rupture were fourfold higher than in the contralateral, unaffected joint . This increased production of IGF-1 in OA reflected an attempt of cartilage to restore homeostasis, but it remained inefficacious. IGF-1 receptors were present and functional in chondrocytes from OA cartilage and thus were not responsible for the inability of IGF-1 to trigger anabolic events [19, 24, 25]. IGFBPs are key players in the failure of cartilage to readjust to homeostasis during OA. Of the six known IGFBPs, IGFBP-2, -3, and -4 are known to be secreted by articular cartilage or chondrocytes [25–27], with IGFBP-3 being the predominant one . The expression of IGFBP-3 was 24 times as high in human OA chondrocytes as in normal chondrocytes , and the amount of IGFBP-3 synthesized by OA cartilage was three times that in normal cartilage . Similarly, the amount of IGFBP-3 in OA was three times that seen in healthy cartilage, and was positively correlated with the severity of the disease . The molar concentration of IGFBP-3 in the synovial fluid of OA patients was higher than that of IGF-1, leading to a molar ratio of free to bound IGF-1 of less than 1 [21, 22]. In such conditions, no more IGF-1 should be able to reach its receptors on cartilage. To demonstrate the involvement of IGFBPs in IGF-1 bioactivity in vitro, Sunic and co-workers showed that des (1–3) IGF-1, a mutant of IGF-1 lacking the N-terminal tripeptide and with decreased affinity for IGFBPs, stimulated the production of proteoglycans by cultured chondrocytes to a higher extent than did IGF-1 . Additionally, anabolic responses of chondrocytes to IGF-1 were dependent on the level of secreted IGFBPs, and the addition of IGFBP-3 blocked the effects of IGF-1 . According to the growing evidence that IGFBPs (and especially IGFBP-3) are involved in the decline of the synthesizing responses of OA cartilage, we hypothesized that these proteins could be pharmacological targets for the treatment of OA. In this study, a nonpeptide small molecule previously described as a potent inhibitor of interaction between IGF and IGFBP  was used as a potential tool to restore the anabolic response of OA chondrocytes to IGF-1. Cartilage fragments and chondrocytes were derived from tibial plateaus and femoral condyles of 3-week-old rabbits or obtained after surgery for knee replacement in OA patients (Hôpital Cochin, Paris), as described elsewhere [33–35]. During the dissection, care was taken to avoid bony, bloody, or fibrous pieces, and cartilage fragments were carefully washed before the isolation of chondrocytes. Rabbit chondrocytes were isolated from cartilage by digestion in Hank's balanced salt solution (HBSS; Invitrogen, Paisley, UK) containing 3 mg/ml of collagenase (type I; Worthington, Lakewood, NJ, USA) and 2 mg/ml of dispase (from Bacillus polymixa; Invitrogen). Human chondrocytes were isolated from cartilage with similar enzyme concentrations in Ham F12 medium containing 10% fetal calf serum (FCS). Ethical guidelines for experimental investigations in animals were followed. The experimental protocols were used after consultation of the ethics committee of the Institut de Recherches Servier. Recombinant human IGF-1 (rhIGF-1), R3 rhIGF-1 (an analog of IGF-1 with Arg substituted for Glu at position 3), and recombinant human IGFBP-3 (rhIGFBP-3) were from Sigma (St Louis, MO, USA). 125I-labeled IGF-1 and IGF-2 (specific activity 2000 Ci/mmol) were from Amersham Biosciences (Buckinghampshire, UK). NBI-31772 [1-(3,4-dihydroxybenzoyl)-3-hydroxycarbonyl-6,7-dihydroxyisoquinoline; C17H11NO7, 342.06 Da]  was synthesized by Professor J-Y Laronze (University of Reims, Reims, France). During the course of these experiments, NBI-31772 was made available from Calbiochem (San Diego, CA, USA). We use the term 'protease inhibitors' to refer to a commercialized protease inhibitor cocktail (Complete; Roche, Meylan, France) covering a broad spectrum of serine proteases, cysteine proteases, and metalloproteases. The ability of NBI-31772 to displace the binding of 125I-labeled IGF-1 to IGFBP-3 was assessed by radiobinding assay. Briefly, 125I-labeled IGF-1 (12,000 disintegrations per minute [dpm]) was incubated in 300 μl of 10 mM phosphate-buffered saline (PBS), pH 7.4, containing 0.02% Nonidet P40 (NP40), with 1 ng IGFBP-3, with or without various concentrations of IGF-1 or NBI-31772. After 3 hours at room temperature, bound 125I-labeled IGF-1 in the incubation mixture was separated from free material by precipitation with 1 ml of 28% polyethylene glycol (PEG 6000) containing 0.5 mg/ml bovine gamma globulins. After 30 minutes at 4°C, the mixtures were centrifuged for 30 min at 3400 g. Supernatants were removed by aspiration and the pellets containing 125I-bound IGF-1 were counted in a gamma counter. The percentage of bound material was expressed as B/B0 where B represented binding in the presence of the competitor and B0 represented binding in the absence of competitor (maximal binding). Typically, B0 ranged between 25 and 30% and nonspecific binding was 5%. A dose-dependent inhibition was observed with IGF-1, with a median inhibitory concentration (IC50) of 0.1 nM and the displacement curve obtained with NBI-31772 was parallel to that of IGF-1, with an IC50 of 2 nM. Chondrocytes were grown in Ham F12 medium containing 10% FCS, 100 IU/ml penicillin, and 100 μg/ml streptomycin. Confluent cells were incubated in serum-free medium for 24 h. This medium was discarded and cells were further incubated in fresh, serum-free medium. Explants were dissected out from cartilage, washed extensively with Dulbecco's phosphate-buffered saline without calcium and magnesium (DPBS, Gibco), and incubated directly in serum-free Ham F12 medium without prior incubation in FCS-containing medium. Secretion media from chondrocytes or cartilage explants were collected after 48 hours and supplemented with protease inhibitors. Samples were electrophoresed on laboratory-made 7.5–15% gels and transferred onto a nitrocellulose membrane (Hybond ECL, Amersham Biosciences) for ligand blot analysis . After two washes of 5 minutes each in 10 mM Tris-buffered saline, pH 7.4, containing 0.15 M NaCl (TBS), membranes were incubated for 30 minutes in TBS containing 3% NP40 and blocked in TBS containing 0.5% (w/v) gelatin (Bio-Rad, Hercules, CA, USA) overnight at 4°C. Membranes were washed in TBS containing 0.1% Tween-20 for 10 minutes and further dried for 2 hours at room temperature. Then membranes were incubated in 20 ml of TBS containing 0.15% gelatin plus a mixture of 125I-labeled IGF-1 and IGF-2 (5 × 105 dpm of each) for 24 hours at 4°C, washed twice in TBS containing 0.1% Tween-20, then three times in TBS, and dried. Gamma radiations corresponding to IGFBPs were captured by autoradiography on Biomax MS films (Eastman Kodak Co, Rochester, NY, USA). Chondrocytes grown to confluence in 24-well plates were transferred to serum-free medium for 24 hours to discard FCS components. In type I experiments, designed to compare the effects of IGF-1 and the non-IGFBP binding mutant of IGF-1, R3 IGF-1, fresh serum-free medium containing 0.1% BSA was added with either peptide and 1.5 μCi/ml Na[35SO4] and incubation was continued for 48 hours. In type II experiments, performed on rabbit chondrocytes, fresh, serum-free medium containing 0.1% BSA was added with or without IGF-1, IGFBP-3, and NBI-31772. After 2 hours, 1.5 μCi/ml Na[35SO4] was added in each well and incubation was continued for 24 hours. In type III experiments, performed on human OA chondrocytes, fresh, serum-free medium containing 0.1% BSA with or without IGF-1 or R3 IGF-1 was added to the cells and they were incubated for 24 hours. Then NBI-31772 was added without renewing the medium, and 1.5 μCi/ml Na[35SO4] was added 2 hours later. Incubation was continued for 24 more hours. In both experiment types, the number and DNA content of cells were not modified by the treatments. The incorporation of [35S]sulfate into proteoglycans was determined in the incubation medium and in the cell layer exactly as described elsewhere . The cell layer was treated separately with 3 M guanidinium chloride in 50 mM Tris/HCl, pH 7.4, for 48 hours at 4°C. Aliquots of the incubation medium or the cell layer were spotted on Whatman 3 MM paper (Sigma, St Louis, MO, USA), precipitated with 1% cetylpyridinium chloride containing 0.3 M NaCl, and dried. Scintillation fluid was added and samples were counted in a beta counter. Statistical differences between treated and control cells were assessed by Student's t-test. Chondrocytes were grown in 12-well dishes in Ham F12 medium containing 10% FCS, 100 IU/ml penicillin, and 100 μg/ml streptomycin. Confluent cells were incubated in serum-free medium for 6 hours and further incubated for 1 hour at 4°C in 500 μl of DPBS, pH 7.4, containing 0.1% BSA and protease inhibitors, with 1 × 105 dpm of 125I-labeled IGF-1 with or without IGF-1 or NBI-31772. Previous experiments had shown that 125I-labeled IGF-1 bound specifically to the cell surface of chondrocytes by means of its receptors. No significant binding to cell-surface IGFBPs was observed. The incubation medium was harvested and cells were washed three times with DPBS. Cells were lysed for 15 minutes in 1 N NaOH. Radioactivities present in supernatants, lavage media, and cells were counted to estimate the percentage of cell-associated 125I-labeled IGF-1. The methodology was adapted from that of Bhakta and co-workers . Explants were dissected out from a visually homogeneous OA cartilage area. Cartilage explants were minced to less than 1 mm3 and were divided equally and distributed in a 24-well plate at 20 explants (~2 mg) per well in 1 ml of DPBS containing 0.1% BSA and protease inhibitors. NBI-31772, IGF-1, or 1.5 M NaCl was dispensed into wells for 24 hours at 4°C, and 125I-labeled IGF-1 (20,000 dpm) was added to each well for 24 more hours. The medium was harvested and distributed into tubes, and explants were washed three times with 1 ml of DPBS plus 0.1% BSA. Each lavage medium was also collected for counting. The explants in each well were harvested carefully with a spatula and put into tubes, in 1 ml of DPBS, 0.1% BSA. Radioactivity present in medium, lavage medium, and explants was counted. After counting, explants were harvested, dried for 8 hours at 60°C, and weighed. The amount of 125I-labeled IGF-1 remaining in cartilage was corrected for the weight. The percentage displacement was calculated as 100 – [(dpm/mg in explants in the presence of competitors) / (dpm/mg in explants in the absence of competitors)] × 100. Data are expressed as means ± SEM. Statistical differences were analyzed using Student's t-test. 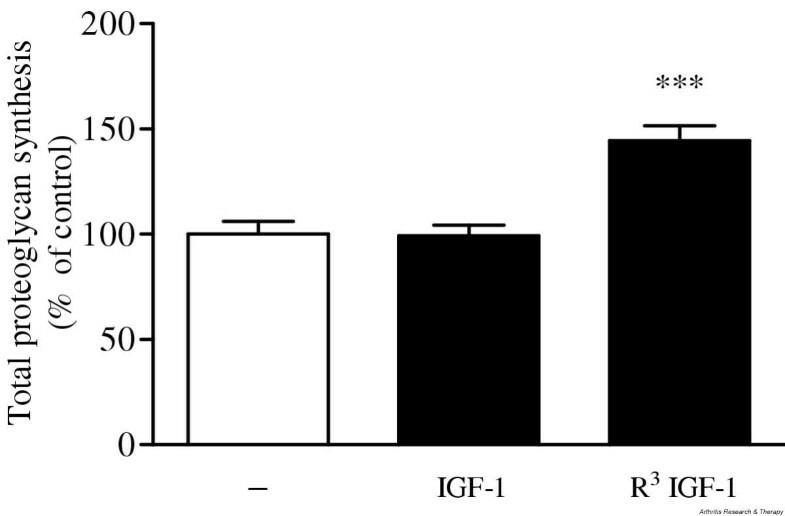 The ability of IGF-1 to stimulate proteoglycan synthesis in human OA chondrocytes was compared with that of R3 IGF-1, an IGF-1 analog with a greatly reduced affinity for IGFBPs (Fig. 1). A 48-hour stimulation time with 2.7 nM IGF-1 was ineffective in promoting proteoglycan synthesis by chondrocytes. By contrast, 2.7 nM R3 IGF-1 significantly stimulated total proteoglycan synthesis, by 45% over that by unstimulated cells. Since IGF-1 and R3 IGF-1 have similar affinities for the IGF-1 receptor, the anabolic effect of IGF peptides depended on the presence of IGFBPs in the extracellular medium. Effect of insulin-like growth factor (IGF)-1 and R3 IGF-1 (an analog of IGF-1 with a greatly reduced affinity for IGF-binding proteins) on total proteoglycan synthesis by human osteoarthritis chondrocytes. Cells were stimulated for 48 hours with 2.7 nM IGF-1 or R3 IGF-1 and total proteoglycan synthesis was measured. Data are expressed as the means and SEM of four replicates from a representative experiment (out of three independent cultures). Statistical differences from the control were measured using Student's t-test. ***P < 0.001. To analyze IGFBPs secreted by chondrocytes, aliquots of the secretion medium of primary cultured chondrocytes or cartilage explants were subjected to SDS–PAGE followed by western ligand blotting (Fig. 2). The identity of secreted IGFBPs was determined by running rhIGFBP-1, -2, -3, -4, -5, and -6 in neighbouring wells during electrophoresis. Primary cultured chondrocytes secreted IGFBP-3 as the majority IGFBP form (appearing as a characteristic doublet at 39–42 kDa), and IGFBP-4 was also identified in all specimens consistently, although more faintly. IGFBP-2 was also found in some specimens. By contrast, IGFBP-3 was the only IGFBP secreted by OA cartilage explants from various specimens. Western ligand blotting analysis of insulin-like growth factor (IGF)-binding proteins (IGFBPs) secreted by human osteoarthritis (OA) chondrocytes or human OA cartilage. Aliquots of the 48-hour secretion medium of confluent OA chondrocytes or cartilage explants were electrophoresed and electroblotted onto a nitrocellulose membrane. IGFBPs were detected by incubating the membrane with a mixture of 125I-labeled insulin-like growth factor (IGF)-1 and 125I-labeled IGF-2, followed by autoradiography. Shown are two and three representative specimens of IGFBP-containing media from chondrocytes and cartilage explants, respectively. 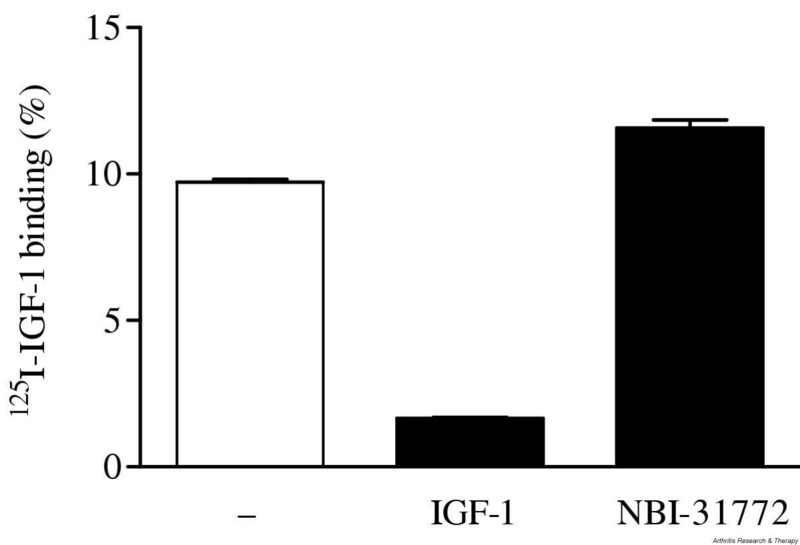 Since they respond normally to IGF-1, primary cultured rabbit articular chondrocytes were chosen to study the effect of exogenous IGFBP-3 and NBI-31772 on IGF-1 stimulated proteoglycan synthesis (Fig. 3). IGF-1 (1.3 nM) alone stimulated total proteoglycan synthesis by a factor of 3.2 (Fig. 3a). The addition of a fourfold molar excess of IGFBP-3 completely abolished the anabolic effect of IGF-1, and a slight deleterious effect was even noticed, with proteoglycan synthesis being 18% less than the control value. Further addition of NBI-31772 antagonized the neutralizing effect of IGFBP-3 on the anabolic effect of IGF-1. NBI-31772 (1 μM) increased proteoglycan synthesis over that measured in the presence of IGF-1 plus IGFBP-3 by 28% (P < 0.05) and this increase reached 210% with 10 μM of NBI-31772 (P < 0.001), corresponding to 154% over the basal control value. NBI-31772 by itself had no effect on proteoglycan synthesis. NBI-31772 at 10 μM significantly stimulated the percentage of cell-associated proteoglycans in the presence of IGF-1 plus IGFBP-3, with a value of 40.3% compared to a control value of 31.3% (P < 0.001) (Fig. 3b). NBI-31772 alone did not significantly affect the ratio of cell-associated proteoglycans. Activity of NBI-31772, a small-molecule inhibitor of the binding of insulin-like growth factor (IGF)-1 to IGF-binding proteins (IGFBPs), in primary cultured rabbit chondrocytes. Chondrocytes were incubated for 24 hours with or without IGF-1, IGFBP-3, or NBI-31772, as indicated, in the presence of 1.5 μCi/ml Na[35SO4]. Neosynthesized proteoglycans were measured by precipitation of nondialysable macromolecules with cetylpyridinium chloride, both in the secretion medium and in the cell layer, and by beta-counting. (a) Total proteoglycan synthesis and (b) cell-associated proteoglycans, calculated as the ratio of 35S-labeled proteoglycans remaining in the cell layer over total proteoglycans. Data are expressed as the means and SEM of four replicates from a representative experiment (out of five independent cultures). Statistical differences between groups containing NBI-31772 plus IGF-1 plus IGFBP-3 and the control group (IGF-1 plus IGFBP-3) were measured by Student's t-test. *P < 0.05; ***P < 0.001. 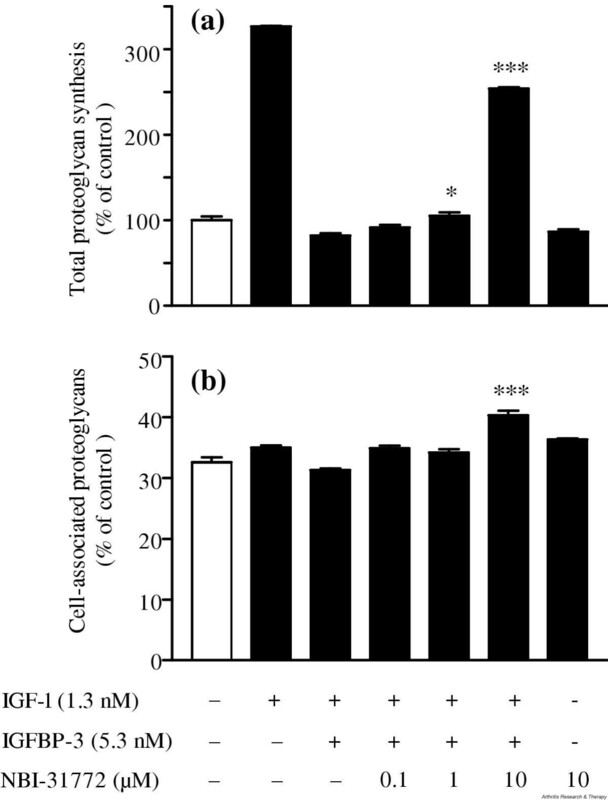 Depending on the concentration used, IGF-1 has no or little effect on proteoglycan synthesis by human OA chondrocytes, whereas R3 IGF-1 displays higher activity. It therefore seems that endogenous IGFBPs are the main determinants of chondrocyte insensitivity to the action of IGF-1. To further test this hypothesis, we incubated chondrocytes for 24 hours with IGF-1 and then added NBI-31772 to the medium and incubated them for 24 more hours. We hypothesized that, once captured by IGFBPs secreted in the extracellular medium, IGF-1 should be released by addition of the small inhibitor compound and be able to interact again with its receptor. IGF-1 at 3.3 nM had no significant anabolic effect (an increase of 7.8%; not statistically significant) in comparison with the basal control, but the addition of NBI-31772 at 10 μM stimulated proteoglycan synthesis by 47% over IGF-1 alone (P < 0.001), or 58% over the basal control (Fig. 4a). A stimulating concentration of IGF-1 (13.3 nM) led to a 52.4% increase in proteoglycan synthesis over the basal control, and further addition of NBI-31772 at 10 μM brought this increase to 104.2% (34% more than with IGF-1 alone; P < 0.001) (Fig. 4b). NBI-31772 alone (added to cells that did not receive IGF-1) had no effect on proteoglycan synthesis. These results suggest that NBI-31772 either restored or augmented IGF-1-dependent anabolism in human OA chondrocytes by disrupting the interaction of the growth factor with its endogenous IGFBPs. As also observed in rabbit articular chondrocytes, NBI-31772 at 10 μM stimulated the percentage of cell-associated proteoglycans compared with IGF-1 used at 3.3 nM or 13.3 nM, with values significantly increasing from 13.5% to 15.9% of total proteoglycans in the former case (P < 0.05), and from 13.0% to 16.0% (P < 0.001) in the latter case (Fig. 4c and 4d). Effect of NBI-31772, a small-molecule inhibitor of the binding of insulin-like growth factor (IGF)-1 to IGF-binding proteins (IGFBPs), in primary cultured human osteoarthritic chondrocytes incubated with IGF-1. Chondrocytes were incubated with (a,c) 3.3 nM or (b,d) 13.3 nM IGF-1 for 24 hours; NBI-31772 (0.1–10 μM) was added and the cells were incubated for 24 more hours, in the presence of 1.5 μCi/ml Na[35SO4]. (a,b) Total proteoglycan synthesis and (c,d) cell-associated proteoglycans calculated by the ratio of 35S-labeled proteoglycans remaining in the cell layer over total proteoglycans. Data are expressed as the means and SEM of four replicates from a representative experiment (out of four independent cultures). Statistical differences between groups containing NBI-31772 plus IGF-1 and the respective control group (IGF-1 at 3.3 nM or 13.3 nM) were measured by Student's t-test. *P < 0.05; ***P < 0.001. In further experiments, the stimulating effect of NBI-31772 was tested in the presence of R3 IGF-1 by comparison with IGF-1. Since R3 IGF-1 does not bind to IGFBPs, we hypothesized that NBI-31772 should not affect proteoglycan synthesis induced by this mutant IGF-1. As expected, NBI-31772 stimulated IGF-1-dependent proteoglycan synthesis in a dose-dependent manner (Fig. 5a), but R3 IGF-1 activity, which by itself was highly enhanced compared with IGF-1, remained unaffected by NBI-31772 (Fig. 5b). This experiment definitely ruled out the possibility that NBI-31772 may act independently of its ability to inhibit the interaction between IGF-1 and IGFBP. However, the percentage of cell-associated proteoglycans was significantly increased from 13.6% to 16.5% (P < 0.001) when 10 μM NBI-31772 was added to the medium containing R3 IGF-1 (Fig. 5d), showing that the effect of NBI-31772 on proteoglycan redistribution depended on cell responses to IGF-1 peptides, rather than to their ability to bind to IGFBPs. NBI-31772 alone did not affect the percentage of cell-associated proteoglycans (not shown). Comparative activity of NBI-31772, a small-molecule inhibitor of the binding of insulin-like growth factor (IGF)-1 to IGF-binding proteins (IGFBPs), in primary cultured human osteoarthritic chondrocytes incubated with IGF-1 or R3 IGF-1 (an analog of IGF-1 with a greatly reduced affinity for IGFBPs). Chondrocytes were incubated with (a,c) 3.3 nM IGF-1 or (b,d) 3.3 nM R3 IGF-1 for 24 hours; NBI-31772 (0.1–10 μM) was added and the cells were incubated for 24 more hours in the presence of 1.5 μCi/ml Na[35SO4]. (a,b) Total proteoglycan synthesis and (c,d) cell-associated proteoglycans, calculated from the ratio of 35S-labeled proteoglycans remaining in the cell layer over total proteoglycans. Data are expressed as the means and SEM of four replicates from a representative experiment (out of four independent cultures). Statistical differences between groups containing NBI-31772 plus IGF-1 or R3 IGF-1 and the respective control groups (IGF-1 or R3 IGF-1) were measured using Student's t-test. *P < 0.05; ***P < 0.001. To ensure that NBI-31772 did not affect the binding of IGF-1 to its receptors, it was used as a potential competitor in a cell-binding assay on human OA chondrocytes (Fig. 6). 125I-labeled IGF-1 bound specifically to confluent chondrocytes, since 84% of the radioactivity could be released by the addition of excess unlabeled IGF-1. When added at the highest dose used in biological assays (10 μM), NBI-31772 did not displace specific 125I-labeled IGF-1 binding from the cell surface. Effect of NBI-31772, a small-molecule inhibitor of the binding of insulin-like growth factor (IGF)-1 to IGF-binding proteins, on 125I-labeled IGF-1 binding to human osteoarthritic chondrocytes. Confluent chondrocytes were incubated with 1 × 105 dpm 125I-labeled IGF-1 with or without excess (150 nM) IGF-1 or 10 μM NBI-31772 for 1 hour at 4°C. Medium was harvested and cells were washed three times with Dulbecco's phosphate-buffered saline. Cells were lysed in 1 N NaOH. The percentage of 125I-labeled IGF-1 bound to the cells was calculated as dpm in NaOH-treated cells over total dpm. Data are expressed as the means and SEM of four replicates from a representative experiment (out of two independent cultures). This experiment was set up to determine whether NBI-31772 would displace 125I-labeled IGF-1 from its IGFBPs within cartilage. To ensure maximal homogeneity, 20 explants coming from a restricted area of a single cartilage specimen were selected for each well. Cartilage explants previously incubated with potential competitors or not were further incubated with 20,000 dpm 125I-labeled IGF-1. The amount of 125I-labeled IGF-1 remaining in cartilage in the presence of 11.7 nM IGF-1 was 53% of the control value, demonstrating that only 47% of the radiolabeled peptide was bound specifically to proteins within cartilage (Fig. 7). No further displacement was observed with higher IGF-1 concentrations (not shown). About 43% of the cartilage-associated radioactivity was removed with 1.5 M NaCl, showing that nearly half of the 125I-labeled IGF-1 was bound in a nonspecific manner to cartilage through ionic interactions, possibly to proteoglycans. By contrast with IGF-1, R3 IGF-1 did not compete with 125I-labeled IGF-1, demonstrating that IGF-1 was primarily bound to IGFBPs within cartilage. NBI-31772 (10 μM) did not compete with 125I-labeled IGF-1 binding to cartilage IGFBPs, suggesting that it did not penetrate into cartilage. Competition of NBI-31772, a small-molecule inhibitor of the binding of insulin-like growth factor (IGF)-1 to IGF-binding proteins (IGFBPs), with 125I-labeled IGF-1 binding to cartilage. Explants cut from a homogeneous area of osteoarthritic cartilage were separated in equal groups and incubated with 11.7 nM R3 IGF-1 (an analog of IGF-1 with a greatly reduced affinity for IGFBPs), 11.7 nM IGF-1, 1.5 M NaCl or 10 μM NBI-31772 in 1 ml of Dulbecco's phosphate-buffered saline (DPBS) for 24 hours at 4°C. 125I-labeled IGF-1 (20,000 dpm) was added to each incubation medium and the cells were incubated for 24 more hours. The medium was harvested and explants were washed three times with DPBS. The radioactivity in medium, lavage buffer, and cartilage explants was counted. The percentage of 125I-labeled IGF-1 remaining in cartilage was corrected for the weight of explants and divided by total counts. Data are the means of two experiments. Results are expressed as percentages of the control value (cartilage incubated with 125I-labeled IGF-1 alone). The loss of anabolic responses of chondrocytes to IGF-1 is one of the reasons why diseased cartilage cannot counteract the action of catabolic cytokines during OA. The results of the present study show that NBI-31772, a small, nonpeptide compound that binds to endogenous IGFBPs and releases biologically active IGF-1 , can restore proteoglycan synthesis by human OA chondrocytes, therefore opening the possibility of a new field of pharmacological intervention for the treatment of OA and other joint-related diseases. As previously demonstrated in ovine and bovine chondrocytes , a mutant of IGF-1 with strongly decreased affinity for IGFBPs was able to stimulate the synthesis of proteoglycans by OA chondrocytes to a higher extent than did IGF-1. This simple but convincing experiment was the basis for suspecting the involvement of endogenous IGFBPs in the loss of IGF-1 effects in OA chondrocytes, and it was a prerequisite to justify their targeting. Three forms of IGFBPs were found to be secreted by human OA chondrocytes, the major one being IGFBP-3. 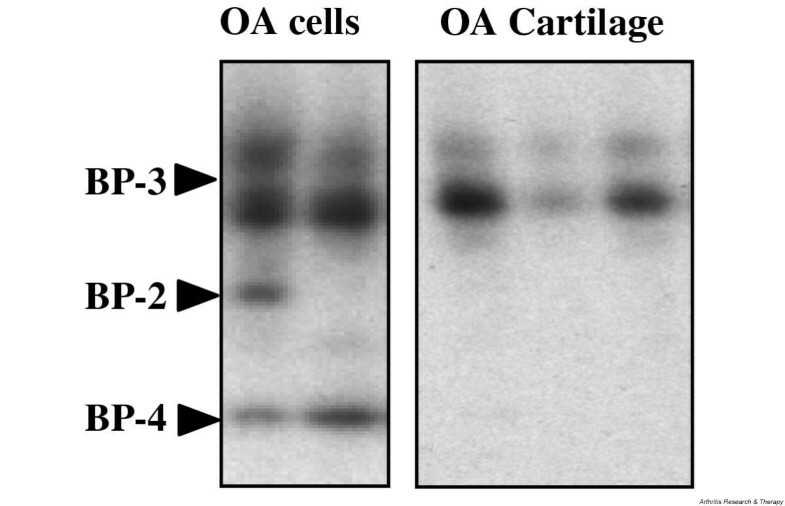 OA cartilage explants secreted IGFBP-3 exclusively. In a functional radiobinding assay, NBI-31772 displaced the binding of 125I-labeled IGF-1 at a molar concentration 20 times that of unlabeled IGF-1. Although the ability of NBI-31772 to displace 125I-labeled IGF-1 from the other IGFBPs has not been checked in this study, it has been previously shown that it can interact with all six IGFBPs with similar efficacy . Therefore, it is probable that in the experiments with OA chondrocytes, NBI-31772 also acted by displacing IGF-1 from IGFBP-2 and -4 in addition to IGFBP-3. In the first set of experiments with rabbit chondrocytes, IGFBP-3 at a concentration four times that of IGF-1 completely abolished the stimulation of proteoglycan synthesis by IGF-1, and NBI-31772 partially restored IGF-1-dependent synthetic activities at 1 μM and almost totally at 10 μM. These concentrations were much higher than those found to displace 125I-labeled IGF-1 from IGFBP-3 in the radiobinding assay. This discrepancy was also found in a previous study reporting the activity of NBI-31772 on the reversal of IGFBP-3 inhibition of Balb/c3T3 IGF-1-dependent proliferation . The higher amounts of IGFBP-3 used in the biological assays compared with the radiobinding assay may in part account for this discrepancy. On the other hand, differences may rest on a decreased stability of the chemical compound in a biological environment and/or to its capture or neutralization by chondrocyte-secreted proteins or macromolecules, thus limiting its activity. Similar results were found for human OA chondrocytes, without addition of IGFBP-3. In this cellular model, we asked whether NBI-31772 could displace IGF-1 from endogenous IGFBPs. As also found by others [27, 29, 39], IGF-1 was either not detectable or poorly detectable in the extracellular medium, reflecting poor ability of chondrocytes to secrete IGF-1. Thus, it was given exogenously. The addition of NBI-31772 was able to activate or increase proteoglycan synthesis, showing that complexes of IGF-1 with IGFBP could be disrupted to release bioactive IGF-1. NBI-31772 also significantly increased the ratio of cell-associated proteoglycans in the presence of IGF-1/IGFBP complexes. When, in these experiments, IGF-1 was replaced by R3 IGF-1, the stimulating effect of NBI-31772 on proteoglycan synthesis was completely abolished, thus ruling out the possibility that NBI-31772 may act independently of the inhibition of IGF-1-binding to IGFBPs. However, an increase of cell-associated proteoglycans was still observed, showing that this effect of NBI-31772 occurred apart from IGFBPs. Although unexplained, this mechanism may be important in a pathological context, since communication between chondrocytes and the extracellular matrix is disrupted in OA, and an increase of pericellular proteoglycans may help to maintain chondrocytes in a more favorable environment. Under physiological conditions, IGF-1/IGFBP complexes can be disrupted by various proteases , thereby releasing active IGF-1. In a recent report by Fowlkes and co-workers, matrix metalloproteinase 3 was able to disrupt IGF/IGFBP-3 complexes and to liberate free, intact IGFs able to phosphorylate the IGF-1 receptor and to trigger cell proliferation . A few different approaches have been used to prevent excessive sequestration of IGF-1 and restore its bioavailabity in pathological conditions. Mutant peptides of IGF-1 still able to bind to IGFBPs but with very weak affinity for the IGF-1 receptor were designed to displace native IGF-1 from endogenous IGFBPs [41–45]. Phage-displayed peptide libraries yielded small peptide compounds able to selectively displace IGF-1 from IGFBP-1 or IGFBP-3 [45, 46]. From the last generation, low-molecular-weight compounds (fluorenylmethoxycarbonyl derivatives) were shown to bind to the IGF-1 binding site on IGFBP-5 , and small isoquinoline compounds were shown to displace IGFs from IGFBPs without selectivity for a particular IGFBP [32, 38, 44, 48, 49]. These molecules have been proposed as potential drug candidates for the treatment of diabetes [32, 45], renal disease , or neurodegenerative diseases [43, 44]. Most of the current pharmacological approaches for the treatment of OA aim to prevent catabolism by blocking actors of the deleterious cascade, while restoration of anabolism or cartilage regeneration still rests on invasive procedures . In this context, in situ cartilage regeneration by growth-factor therapy, including targeting of cartilage defects with fibrin–(chondrocyte)–IGF-1 composites [52, 53], or gene therapy with IGF-1 delivered intra-articularly [54–56], have been proposed. To be effective, the amount of IGF-1 delivered within the joint in this way should exceed the binding capacity of local IGFBPs. In addition to noninvasive intervention, one of the main advantages of our proposed strategy would be to target directly the actors of cartilage unresponsiveness to IGF-1, and to bypass the capture of exogenous IGF-1 by IGFBPs. Keeping this objective in mind, it is clear that the small compound used in this study, NBI-31772, should be considered only a tool to demonstrate the concept in vitro. Indeed, concentrations of NBI-31772 active in the biological assays were relatively high (1–10 μM) and would be incompatible with in vivo trials. Secondly, NBI-31772 did not penetrate into cartilage. This should not be an exclusion criterion per se, since one may hypothesize that if the compound were capable of reaching the synovial fluid or cartilage surrounding tissues, it might release IGF-1 captured by IGFBPs in these tissues and sustain its action in cartilage. However, the in vivo duration of action of NBI-31772 was short , which implies that in vivo trials to assess the therapeutic relevance of this class of molecule in joint diseases need to be performed with more stable molecules. In view of a therapeutic application, the optimization of small chemical inhibitors of IGF/IGFBP interaction would be preferred over the use of IGF-1 peptide mutants (either binding receptors and triggering biological effects without binding IGFBPs, or, conversely, displacing endogenous IGF-1 from IGFBPs without binding receptors), since the former should be more easily optimizable while the latter should be more susceptible to the attack by proteases. In a clinical context, compounds that selectively target IGFBP-3 would be mandatory if oral availability is preferred, in order to avoid or to limit side effects caused by displacing IGF-1 from its binding proteins in undesirable tissues. This question of selectivity may not be so important in the case of topical delivery, and local treatment should be envisaged instead. A small, nonpeptide pharmacological inhibitor of IGF/IGFBP interaction restored or enhanced the IGF-1-dependent proteoglycan synthesis by human osteoarthritic chondrocytes. This finding offers a rationale for pharmacological intervention in the treatment of cartilage repair in osteoarthritis and potentially of other joint-related diseases and shows that IGFBPs are pertinent target candidates for this purpose. We thank Prof J-Y Laronze for chemical synthesis of NBI-31772.